ElyRose er et nyligt og prestigiously renoveret, rummelig og solbeskinnet lejlighed beliggende på 5. sal (med elevator) i en elegant gammel bygning et par meter væk fra Santa Maria Maggiore, en af ​​de fire store basilikaer i Rom, i det livlige Monti distrikt, på kun 150 mt væk fra undergrundsstationer i Vittorio Emanuele (linje A) og 250 mt fra Cavour Station (linje B). Det er lige i midten Colosseum og Termini Station. Dette 120 m² mt lejlighed er det bedste valg til at nyde dit ophold i den evige by, da det ligger i gåafstand fra mange turistmæssige attraktioner og området er fuld af vinbarer, restauranter og butikker. Vi står til din fulde rådighed før og under dit ophold med tht formål at gøre dit vation i vores ejendom en meget mindeværdig. Vi kan organisere pick up service fra og til lufthavnen og til Civitavecchia havn, hjemmelavede italienske måltider og guidede ture. Lejligheden består af 2 store soveværelser og en mindre: et soveværelse med en kingsize seng, hvor en enkelt seng kan nemt opended som foldes til at være et pust; en tredobbelt soveværelse med både en konge størrelse og en enkelt seng eller 3 enkeltsenge; og et mindre soveværelse med en kingsize seng. ElyRose House har 2 moderne og elegante badeværelser (det ene med en hydro massage badekar, skal også anvendes som bruser, det andet med en stor bruseniche). Desuden et stort lyst og fuldt udstyret spisestue med komplet køkken faciliteter og adgang til den fantastiske terrasse, hvor du vil tilbringe nogle memorables øjeblikke! Hvert værelse har en individuel adgang til balkonen. Lejligheden er præget af originale, smukke og farverige marmorgulve og højt hvælvede lofter. Det er fuldt udstyret med aircondition (i hvert værelse! ), Wi-fi internetforbindelse og 3 TV SAT med omkring 200 internationale kanaler. Termini Station (hovedbanegården i byen) er i gåafstand med direkte offentlige forbindelser fra / til begge lufthavne. Really nice, well equipped and spacious apartment- and really nice rooftop terrace! We enjoyed our stay at this flat. The owners efficiently answered emails, the flat was very clean, the location was convenient to the underground and train station. We had no problem getting around on foot or by public transport. We enjoyed the outdoor balcony immensely. You can’t go wrong staying here with 6 or fewer people. A fantastic apartment and a fantastic host. Located near many restaurants and supermarkets. 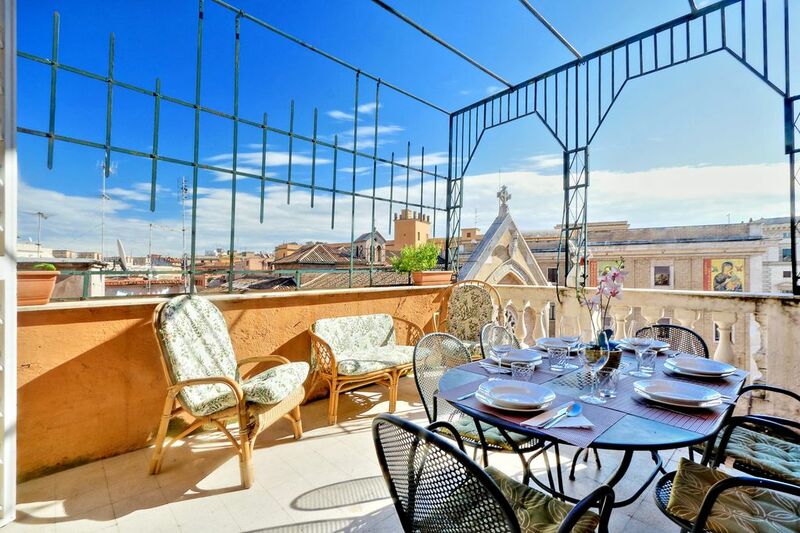 Convenient access to the Colosseum, Roman Forum, Roma Termini, and metro subways. After a long flight and morning arrival, we were so grateful that Elisa had arranged for us to be met at the airport and driven directly to the apartment where we were warmly greeted and allowed to leave our luggage. ElyRose gave us lots of space and comfort for 6 people and the beautiful terrace was a bonus. The location was very convenient: within walking distance of the Colosseum, Termini, metro and bus stops, grocery stores and restaurants...even 3 cell phone stores where we could purchase SIM cards. Thank you Elisa and Team for a wonderful stay in Rome. Fabulous family holiday spot, we loved it! We LOVED our stay, Elisa is a fabulous, friendly, helpful host and the property is even more beautiful than it looks in the photos. Fabulous location, comfortable beds, well equipped kitchen, and very family friendly (we had two grandparents, two parents and two small boys, and we all loved it). The deck is incredible, coffee and fresh pastries on the balcony every morning (from one of the many wonderful bakeries in the neighbourhood) will be one of my fondest memories of Rome. Ten minutes walk to the Termini, two minutes to the beautiful Santa Maria Maggiore, and two supermarkets within 5 minutes walk, everything we needed for an easy and fantastic family holiday. Thanks so much to Elisa and family for sharing this wonderful place, we hope to return someday! We had a wonderful stay in ElyRose, the booking process was seamless and Cinzia and Elisa responded quickly to any queries we had, we arrived on a early flight and Elisa kindly let us drop off our bags at the apartment until we could check in,. The apartment was spotlessly clean and had plenty of room for our group 5 adults and 1 teenager, we made great use of the amazing terrace, wifi was excellent. The location was one of the reasons we chose ElyRose just a short 15 minute stroll to the colleseum , the metro was a mere 5 minutes stroll away, plenty of restaurants in the locality and a very friendly bar the Druids Den just across the street. All in all we absolutely loved our stay in this delightful apartment.